So he probably is all of those things. However, none of that changes the artistry of his music. It might even inform it. Yeah, but I think his music is getting better. He still plays good RnR. He's got quite a legacy of pretty good albums. His live shows are good. He's the epitome of the "hippie-redneck" music genre. I think you gotta be from the midwest to get it. Caught a TV interview that Sammy Hagar did with John. Mr. Mellencamp came across as a crotchety, old, angry SOB. First Mellencamp song i hear that i actually like. Streaming the entire LP now. Might have to pick this one up. I just read the Allmusic review in this LP, Here is an excerpt.
" This may not be a record that brings chart success, or even critical acclaim, but it does find Mellencamp at a kind of peak, turning out vividly socially conscious roots rock that works not because of the message, but because the music is seductive and sinewy enough to deliver the message. The grooves and riffs are earthy, so much so that when Chuck D drops a rap at the bridge in the title track, it seems natural, not forced; similarly, India.Arie's presence on "Peaceful World" enhances the plea for understanding at the core of the album, instead of distracting from it, and it feels as right as Trisha Yearwood's duet on "Deep Blue Heart." 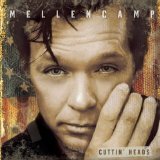 Ultimately, this is a record of small, subtle triumphs, but they are triumphs all the same, finding Mellencamp crafting music that's earthy yet succeeds because of the small details. It's a laid-back record — even when it rocks hard, it rocks like a bunch of guys having fun on a back porch on a Saturday afternoon — but that's its charm, since it's natural, real, and unassuming...."
Not bad. Not great. It's not the 2,678th FM replay of Little Pink Houses, a song to drive us crazy. Drive you crazy. Don't ever assume that everyone else has your issues and, even if they did, they probably wouldn't cry about them twice in the same thread. Not usually a Mellencamp fan, but I'm liking this one. indeed. I am glad he fell off the pop wagon and became true to himself. Good tune. Great slide guitar! +1, not familiar with this album. Great bluesy groove and harmonies on this! Liking this a lot. Good addition to RP. It's not great, but it's good and it anytime sure beats the hell out of the vastly overplayed dreck of Little Pink Houses or that little ditty about Jack and Diane. And a reprieve from his thump thump thump drummer. I go on line to get away form this crap. I like this, and will have to check out other recent stuff. Mellencamp seems like one of the rare pop artists who gets better, and changes, as he ages. First impression: I like the slide guitar. Simple, elegant song that slowly builds. Nothing fancy, just a well written song. Melloncamp is a loser. Can you imagine words that are more trite? \"Touch your lips, perhaps you soul.\" Give me a break! This song is actually okay!